Most writers are deeply invested in how their words are presented, some are involved in the creation and selection of accompanying illustrations and cover art but very few are passionate about how their books are bound. William Inglis Morse, a writer and philanthropist with Nova Scotia roots, was a remarkable exception. When he was ready to publish his first major publication he sought out one of the best bookbinders working at the time. That bookbinder was Douglas Cockerell and this is the story of their extraordinary collaboration. 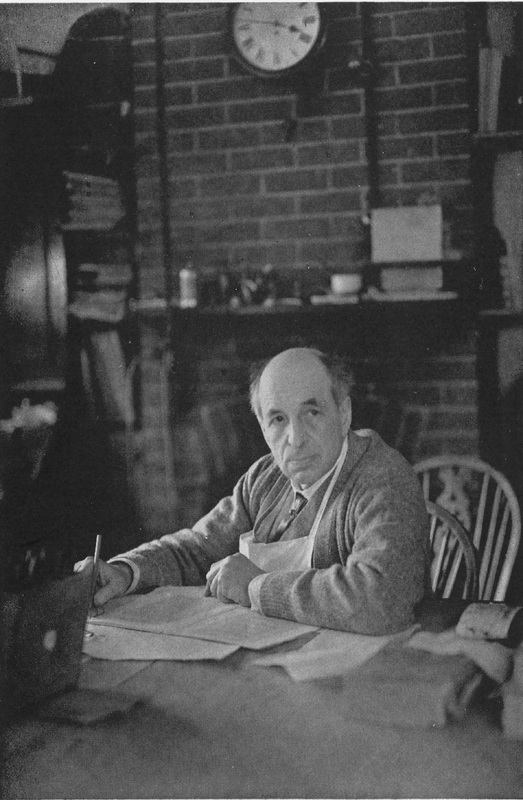 Douglas Cockerell in his workshop at Letchworth, Herts, England, 1935 (Click on image to enlarge). Douglas Bennett Cockerell (1870-1945) was born in the London district of Sydenham and attended the famed St. Paul’s School for Boys. The school’s dynamic and challenging programme did not appeal to Douglas. His widowed mother decided some life experience in the colonies would be a better match. So, at the age of fifteen, young Douglas Cockerell was sent out to Canada to find his way. He worked first as a farm hand, tried wool carding and then landed a job as a bank clerk. Deciding that he had had enough life experience and that it was time to get serious about finding a fulfilling career, Douglas returned to England in 1891. His brother Sydney, a private secretary to William Morris of the Kelmscott Press, introduced Douglas to the books arts. Douglas quickly found that he enjoyed the challenge of creating both aesthetically pleasing and functional book bindings. His interest fully engaged, Douglas set about gaining the skills he needed to become a master fine binder. From 1893 to 1897 Cockerell apprenticed with T.J. Cobden-Sanderson at the Doves Bindery in Hammersmith. Under Cobden-Sanderson’s tutelage, Cockerell learned how to bind new books and how to mend and rebind old bindings. Both were to be done using quality materials and with the highest possible technical skill to ensure longevity and functionality. He was also taught cover designs were to be aesthetically pleasing and in harmony with the contents and proposed use of the book. These deceptively simple tenets combined with his unique artistic ability would drive his creative vision for his entire career as a practitioner and teacher of bookbinding. Immediately upon completion of his apprenticeship, Cockerell launched his own bindery and took up a teaching position at the London County Council Central School of Arts and Crafts. 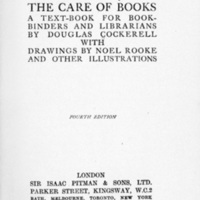 Hampered by the lack of teaching resources, Cockerell wrote his influential manual, Bookbinding and the Care of Books (1901). Douglas Cockerell’s influential bookbinding textbook (Click on image to enlarge). A diagram demonstrating how simple forms can be effectively combined to create complex designs from Cockerell’s Bookbinding and the care of books, page 242 (Click on image to enlarge). Full of clear instructions and advice on how to create complex designs from simple forms, Cockerell ’s manual became the basic text for all bookbinders. Over a hundred years later it is still available in print. He would go on to publish other major works on bookbinding – Some notes on bookbinding (1929) and Bookbinding as a school subject (1939). 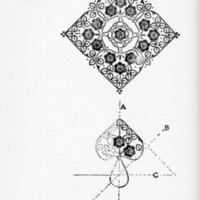 Cockerell was constantly seeking ways to improve and adapt his materials and techniques. Entrusted with rebinding some of England’s most precious manuscripts, Cockerell was especially interested in finding ways to improve binding materials with longevity in mind. Due to his efforts, Cockerell was able to demonstrate the superiority of alum-dressed leather, to establish the importance of using higher quality niger leather, to refine marbling techniques to consistently produce high-quality endpapers and to standardize principles required to ensure reliable results when carrying out book conservation. 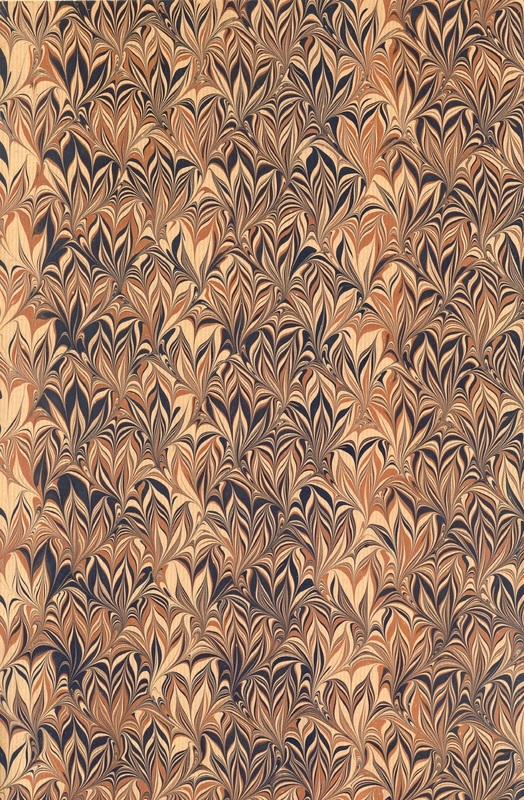 An example of Cockerell’s distinctive marbled paper (Click on image to enlarge). All the time he was teaching, researching old bindings, experimenting with materials, fine-tuning his techniques and writing his manuals, Cockerell continued to be a hands-on fine binder. 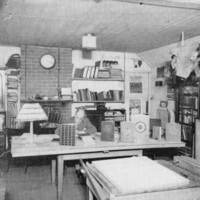 Douglas Cockerell in his workshop, 1935 (Click on image to enlarge). An apprentice hard at work in the Cockerell and Son Bindery, 1935 (Click on image to enlarge). In addition to his work for major research libraries and national museums and libraries, he took on commissioned work. It was through his friend and fellow craftsman, William B. Dalton of the Camberwell School of Arts and Crafts, that Cockerell was introduced to William Inglis Morse. With Dalton’s assistance, Morse had just completed his major work on gravestones in Acadie and he was considering having a few commemorative copies bound in special bindings. He turned to Dalton for advice and the initial contact with Cockerell was made. “when a fine binding is commissioned, the customer and the binder should discuss the binding together as if it were, as it indeed is, a matter of some importance to both of them”. In William Inglis Morse, Cockerell found a supportive and appreciative client who over the years also became a good friend. While most of their exchanges about book design were by humor-filled letters, they did meet as often as they could when Morse was in London and during the summer of 1934 Cockerell spent three weeks at the Morse summer home in Paradise, Nova Scotia. 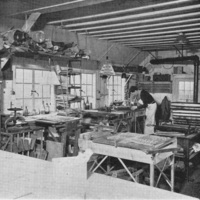 In June 1935 Morse returned the visit and enjoyed a personal tour of Cockerell’s workshop in Letchworth, England. By 1943, they had collaborated on fifty fine bindings. While all very different as they should be based on the content of each book, all the bindings reflect Cockerell’s distinctive style which is succinctly captured in a poem he wrote for Morse in 1934. In rhythmic curves the sea-birds float. And use them in my book designs. During his lifetime Morse distributed his Cockerell fine bindings among family members and the five university libraries he so generously supported - the libraries of Acadia University, University of King’s College and Dalhousie University in Nova Scotia and the libraries of Harvard University and Yale University in the United States. Displayed here are the fine bindings that were given to Dalhousie University. 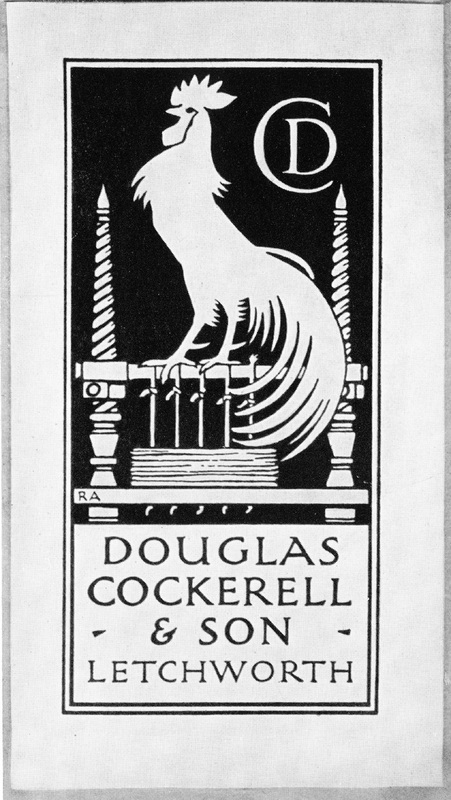 Bookplate of Cockerell & Son, drawn by Robert Austin (Click on image to enlarge). Bush, Susan Hilles. “William Inglis Morse, A Book Collector Extraordinaire” in “The Book disease”: Atlantic Provinces Book Collectors, edited by Eric L. Swanick. Halifax: Dalhousie University School of Library and Information Studies, 1996, pp. 33-70. The Chronicle. Edited by William Inglis Morse. Cambridge, Mass., no. 1, 1905 - no. 255, 1950. Issues with references to Douglas Cockerell are nos. 215, 219, 220, 222, 224, 226, 228, 231 and 237. Cockerell, Douglas. “The binding of books” in Journal of the Royal Society of Arts, Vol. 87 (May 1939), pp. 686-701. Cockerell, Douglas. Bookbinding, and the care of books: A text-book for bookbinder and librarians. Illustrated by Noel Rooke. 4th ed. London: Sir Isaac Pitman & Sons. Ltd., 1924. Cockerell, Douglas. “Fine binding in England” in The Art of the Book: A review of some European and American work in typography, page decoration and binding, edited by Charles Holmes. London: The Studio Ltd., 1914, pp. 69-124. Oxford Dictionary of National Biography Online Edition: “Douglas Bennett Cockerell (1870-1945)”: doi: 10.1093/ref.odnb/32474. Rooke, Noel. “Obituary: Douglas Cockerell, M.B.E., R.D.I.” Journal of the Royal Society of Arts, Vol. 94 (Dec. 1945), pp. 71-73.